A complete rollup image, called Security Monthly Quality Rollup, is made available via Windows Update. This update includes security and non-security updates for Windows 7 or Windows 8.1. A security-only rollup image, called Security Monthly Quality Rollup, is not made available on Windows Update but only via direct downloads, for instance from the Microsoft Update Catalog website. Previews are released on every third Tuesday of the month. 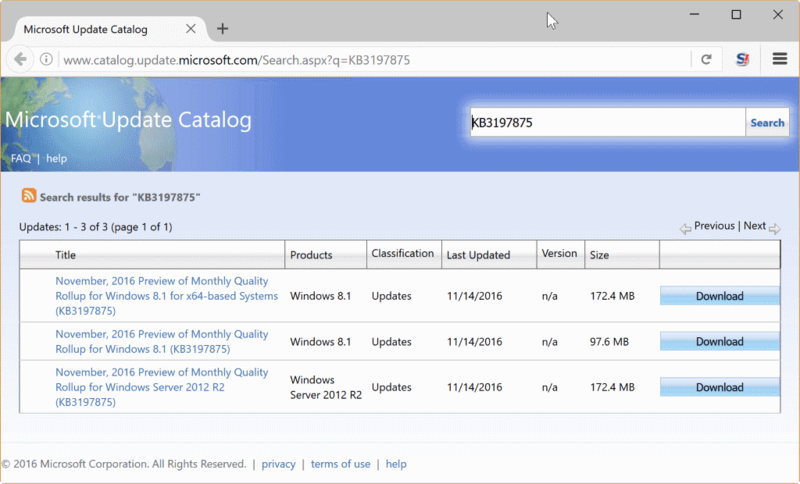 The preview images are only available for the Security Monthly Quality Rollup patches, and available on Microsoft’s Update Catalog and on Windows Update. The patches are tagged as optional on Windows Update though which means that they won’t be installed automatically. Note that only the non-security part of the update is provided as a preview. This entry was posted on Wednesday, November 16th, 2016 at 1:03 pm	and is filed under General News, security. You can follow any responses to this entry through the RSS 2.0 feed. Both comments and pings are currently closed.